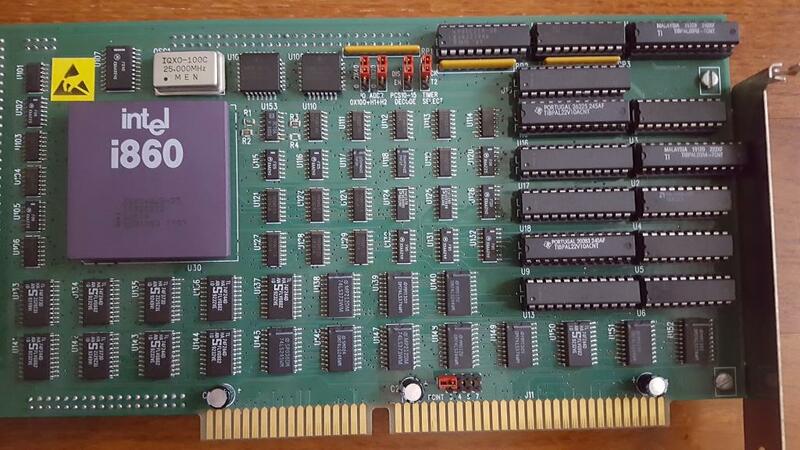 This is yet another i860 accelerator card – this time from good ol’ blighty: The Myriad DASH!860 (I’ll call it the Dash from here on) was made by Myriad Solutions Ltd. from Cambridge. What I’ve got is actually a double “sandwich” card, i.e. Mhh, this setup very much reminds me of the SPEA Fire, which uses the same core parts but thanks to its higher SMD integration manages to squeeze everything onto one ISA board. But let’s start in the good old GeekDot tradition having a closer look at each of the cards. 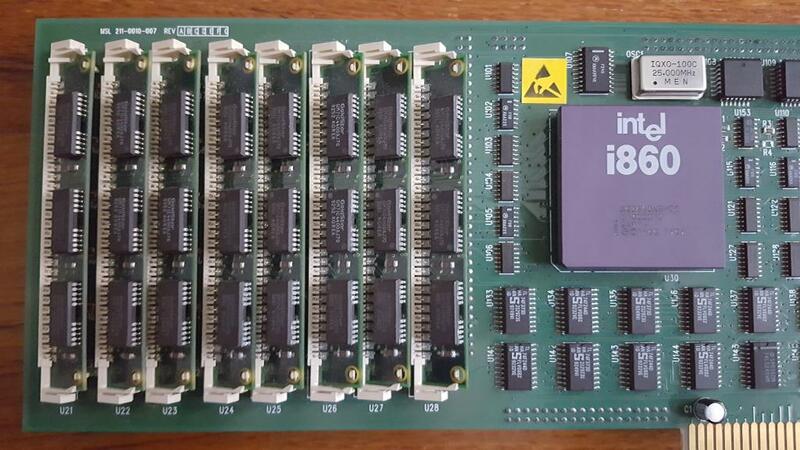 Having seen the other i860 accelerator cards, this isn’t that much different: The 64bit wide memory interface of the i860 is fed by 8 SIMM slots, each containing 1MB of RAM. Lots of DIL PALs has been used. Also the huge array of 8bit latches and buffers would have probably been replaced by 16bit versions later in time. The most interesting fact in my eyes is the choice of the CPU… why did they pick the 25MHz model? The quality check on the back says 1993! In that time, 40MHz models where broadly available – maybe this was a cost reduced version of the Dash? Some sources on the web mention a 40MHz version at least. Most prominent are the 16 VRAM memory ICs in ZIP package. They’re 1Mbit, so we’re looking at a whopping 2MB here. 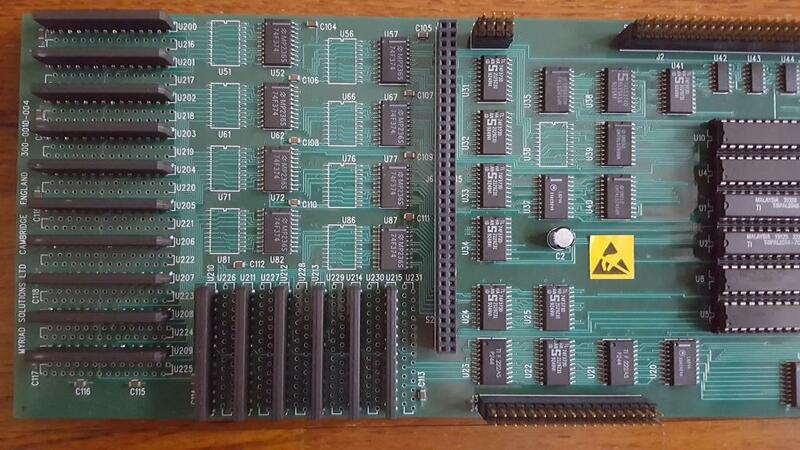 Looking closer you’ll spot there’s room for another 16 ZIP ICs and more buffers – so the video memory can be upgraded to 4MB fairly easy (adding some more flipflops, too). The connectors to the Dash card can be identified quite good here, too. The two transparent thingies in the top-right corner are relays to switch the video signal, i.e. there are two video (VGA) connectors at the cards edge. One 9pin input for looping in the PCs VGA signal and a 15pin output which is normally looped-through. No signals are used on the 8bit ISA slot connector. It’s just for fixing the card in place and power-supply. 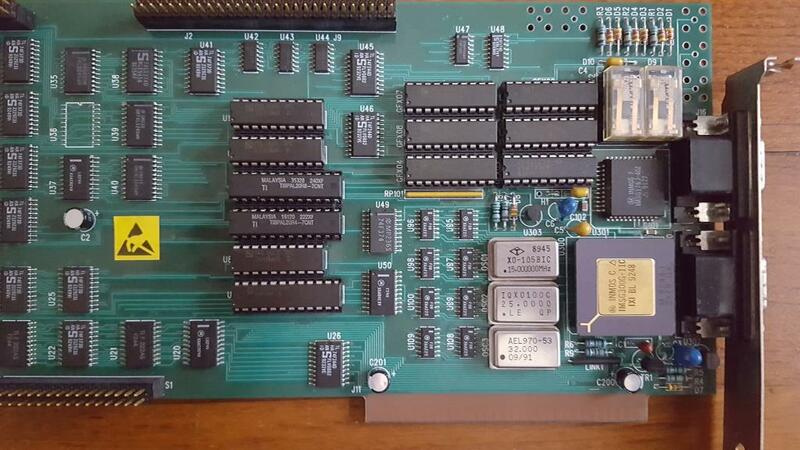 While the DASH!860 seemed to be sold separately as a “general purpose application accelerator” the combination of both cards was mainly targeted at the medical 3D data visualization market. My cards came from the Bio-Rad ThruView PLUS package which included the Dash/ShadeMASTER combo with the ThruView software. I have a copy of the software but it’s copy-protected by a dongle, so I won’t pursue it any further (for now ;-)). See the next chapter handling that software. They called it XNIX. Yeah, that sounds very UNIXish, doesn’t it. A quick inspection of the kernal file shows its a i860 COFF binary and sports many POSIX calls… I was instantly hooked 😯 . Obviously, there are different modes to run it, depending the mode DOS is running in. As you can see, “/e” forces the enhanced-mode, while “/r” does the same with real-mode. B) Try running “X.EXE” with the “/r” switch. “A DASH!860 E or J card is required for ‘real mode’ operation” – most likely a Revision Code. That’s a bit puzzling, as it seems to not using XMS RAM. 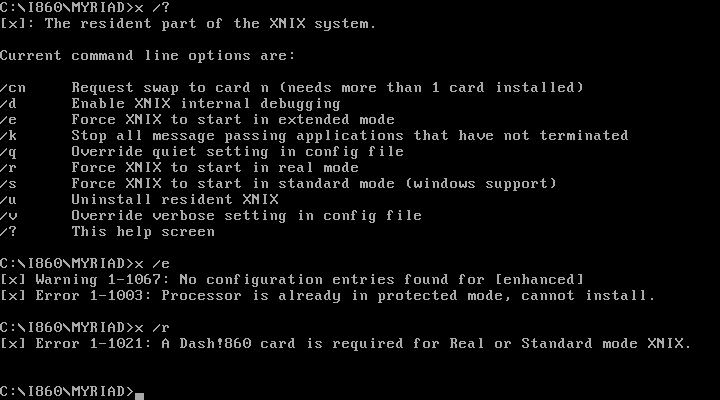 This hints towards a library to be compiled into a DOS executable, which calls XNIX kernel services. I will have to disassemble some of the ThruView binaries and see, if thera are some calls in there which might support that theory (See the ShadeMASTER chapter below). startup.rmx is the bootstrap code for the real and standard mode. stub (a DOS executable) – not totally sure. An included (compiled) BAT file calls this after “x.exe”, using the ThruView x86 binaries as parameters. Maybe a loader of XNIX/COFF binaries ? Not an elegant way using absolute paths and hiding trivial calls in an .EXE file, but getting over it, this helps to understand the start process in further investigations. Many of these keys are very common with most INMOS G3xx devices e.g. the IMS B020. Eek I actually remember 170-02CE and 112-??? – shade master II – it was a long time ago – originally it would’ve had a heatsink on the 860 chip . The ShadeMaster III is much more interesting – don’t suppose you’ve got an alphaDrive? I worked at Myriad 1992 until it was bought out by Synoptics in 1995 thanks for posting! Nope, beyond what’s in the post, I don’t have anything else – that’s like Hardware Archaeology is like 😉 The ShadeMaster stuff is still somewhat, erm, shady – at least the un-dongling was fun. What is an alphaDrive?